The Soviet Union ">[sɐ'vʲetskʲɪj sɐˈjʉs]), officially the Union of Soviet Socialist Republics ">[sɐˈjus sɐˈvʲɛtskʲɪx sətsɨəlʲɪsˈtʲitɕɪskʲɪx rʲɪˈspublʲɪk]), abbreviated to USSR , was a socialist state on the Eurasian continent that existed from 1922 to 1991. A union of multiple subnational Soviet republics, its government and economy were highly centralized. The Soviet Union was a one-party federation, governed by the Communist Party with Moscow as its capital. 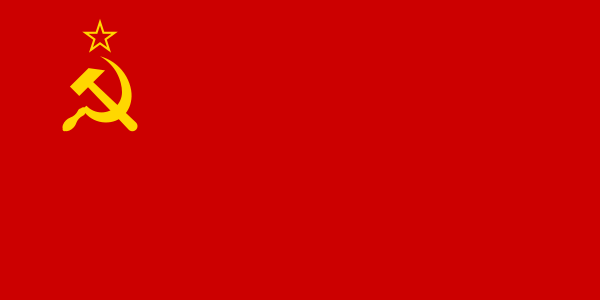 The Soviet Union (Russian: Сове́тский Сою́з, Sovetskiy Soyuz; [sɐ'vʲetskʲɪj sɐˈjʉs]), officially the Union of Soviet Socialist Republics (Russian: Сою́з Сове́тских Социалисти́ческих Респу́блик, Soyuz Sovetskikh Sotsialisticheskikh Respublik; [sɐˈjus sɐˈvʲɛtskʲɪx sətsɨəlʲɪsˈtʲitɕɪskʲɪx rʲɪˈspublʲɪk]), abbreviated to USSR (Russian: СССР, SSSR), was a socialist state on the Eurasian continent that existed from 1922 to 1991. A union of multiple subnational Soviet republics, its government and economy were highly centralized. The Soviet Union was a one-party federation, governed by the Communist Party with Moscow as its capital. The Soviet Union had its roots in the October Revolution of 1917, when the Bolsheviks, led by Vladimir Lenin, overthrew the Russian Provisional Government that had replaced Tsar Nicholas II. They established the Russian Socialist Federative Soviet Republic (renamed Russian Soviet Federative Socialist Republic in 1936), beginning a civil war between the revolutionary "Reds" and the counter-revolutionary "Whites." The Red Army entered several territories of the former Russian Empire and helped local Communists take power through soviets, which nominally acted on behalf of workers and peasants. In 1922, the Communists were victorious, forming the Soviet Union with the unification of the Russian, Transcaucasian, Ukrainian, and Byelorussian republics. Following Lenin's death in 1924, a troika and a brief power struggle, Joseph Stalin came to power in the mid-1920s. Stalin suppressed all political opposition to his rule, committed the state ideology to Marxism–Leninism (which he created), and initiated a centrally planned command economy. As a result, the country underwent a period of rapid industrialization and collectivization which laid the foundation for its victory in World War II and post-war dominance of Eastern Europe. Stalin also fomented political paranoia, and conducted the Great Purge to remove opponents of his from the Communist Party through the mass arbitrary arrest of many people (military leaders, Communist Party members, and ordinary citizens alike) who were then sent to correctional labor camps or sentenced to death. Shortly before World War II, Stalin signed a non-aggression pact with Nazi Germany, after which the two countries invaded Poland in September 1939. In June 1941 the Germans invaded the Soviet Union, opening the largest and bloodiest theater of war in history. Soviet war casualties accounted for the highest proportion of the conflict in the cost of acquiring the upper hand over Axis forces at intense battles such as Stalingrad. Soviet forces eventually captured Berlin in 1945. The territory overtaken by the Red Army became satellite states of the Eastern Bloc. The Cold War emerged by 1947 as the Soviet bloc confronted the Western states that united in the North Atlantic Treaty Organization in 1949. Following Stalin's death in 1953, a period of political and economic liberalization, known as "de-Stalinization" and "Khrushchev's Thaw", occurred under the leadership of Nikita Khrushchev. The country developed rapidly, as millions of peasants were moved into industrialized cities. The USSR took an early lead in the Space Race with the first ever satellite and the first human spaceflight. In the 1970s, there was a brief détente of relations with the United States, but tensions resumed when the Soviet Union deployed troops in Afghanistan in 1979. The war drained economic resources and was matched by an escalation of American military aid to Mujahideen fighters. In the mid-1980s, the last Soviet leader, Mikhail Gorbachev, sought to further reform and liberalize the economy through his policies of glasnost and perestroika. The goal was to preserve the Communist Party while reversing economic stagnation. The Cold War ended during his tenure, and in 1989 Soviet satellite countries in Eastern Europe overthrew their respective communist regimes. This led to the rise of strong nationalist and separatist movements inside the USSR as well. Central authorities initiated a referendum—boycotted by the Baltic republics, Armenia, Georgia, and Moldova—which resulted in the majority of participating citizens voting in favor of preserving the Union as a renewed federation. In August 1991, a coup d'état was attempted by Communist Party hardliners. It failed, with Russian President Boris Yeltsin playing a high-profile role in facing down the coup, resulting in the banning of the Communist Party. On 25 December 1991, Gorbachev resigned and the remaining twelve constituent republics emerged from the dissolution of the Soviet Union as independent post-Soviet states. The Russian Federation (formerly the Russian SFSR) assumed the Soviet Union's rights and obligations and has emerged as the recognized primary legal successor of the Soviet Union.